UP Board 10th and 12th Result 2019: UP Board Result 2019 for Class 10 and Class 12 students will be announced soon. The UP Board Result 2019 will be declared online on the official website i.e. i.e. upresults.nic.in, upmspresults.up.nic.in and results.nic.in. In addition, the UP Result 2019 will also be available on up10.jagranjosh.com and up12.jagranjosh.com, for class 10 and 12 students respectively. As per media reports, the UP Board High School Result 2019 and UP Board Inter Result 2019 will be declared by the end of April 2019. During a recent press conference, UP Board Secretary Neena Srivasata had claimed that “The process of evaluation is on the result will be declared very soon. It will be released by April-end.” This report has put smiles on the faces of nearly 51 lakh students who have appeared for the Board Exams and are now waiting for the UP Board Result 2019. Reports, have also claimed that despite the on-going LokSabha Election 2019, UPMSP has commenced the preliminary preparations for the declaration of UP 10th and 12th Result 2019. The Board is likely to declared results for 10th and 12th students between 15th April 2019 to 25th April 2019. Last year, the UP Board Result for Class 10 and 12 students were declared simultaneously on 29th April 2019. Prior to the declaration of UP Board Result 2019, the UPMSP or the UP Board will issue an official notification about the date and time of the results. The Results will be formally declared in a press meeting at the Prayagraj office of the Uttar Pradesh Madhyamik Shiksha Parishad. Academic experts who have been tracking the UP Board Results 2019 over the years suggest that results will be declared on time to help students meet the timelines for college admissions. As of now, the Uttar Pradesh MadhyamikShikshaParishad / UPMSP has not confirmed any date for the declaration of UP Board Results 2019. Generally, the UP Board High School Result 2019 for Class 10 students and UP Board Intermediate Result 2019 for Class 12 students are announced on the same day. Last year, the UP Board Results were declared on 29th April. Going by the general trend, students can expect the UP 10th Result 2019 and UP 12th Result 2019 to be declared around the same time in the last week of April. The team of Jagranjosh.com is in constant touch with the UP Board officials and will update this page with all the latest news about the UP Board Result 2019. Till then, students are requested to bookmark this page and visit it regularly to get these timely updates. Alternatively, students can also receive these UP Board Result updates directly in their email inbox by providing their information in the form provided above. The UP Board Result 2019 is one of the most eagerly awaited board exam results in the country. With the participation of over 62 lakh students, the exam is deemed as the biggest school-level examination in the world. The high number of participants creates a major logistical problem for the board to declare and publish the results. In fact, every year, the students face issues with regards to checking their UP Board 10th Result and UP Board Intermediate Result online on the official websites i.e., www.upresults.nic.in and upmsp.nic.in. Despite the elaborate arrangements made by the UP Board, the students encounter technical errors and delays in checking their UP Board Result 2019. Keeping this in mind, we would be providing the UP 10th Result 2019 and 12th Board Result 2019 on this page of our website. In order to ensure that the UP Board Result reaches all the students on time, we have developed this website keeping in mind all the technical concerns. Therefore, the students will be able to check their UP Board 10th Result 2019 and UP Board 12th Result 2019 quite easily on this page. Taking a look at the UP Board Result of the previous year can help students understand the general trend of the results and set right and realistic expectations for the UP Board Results 2019. Moreover, prior to the declaration of UP Board 10th and 12th Class Results 2018, students experience a lot of stress and pressure. Having a look at the key statistics of the last year’s results can also help calm their nerves and help them overcome result anxiety. What after UP Board 10th Result 2019 and UP Board 12th Result 2019? 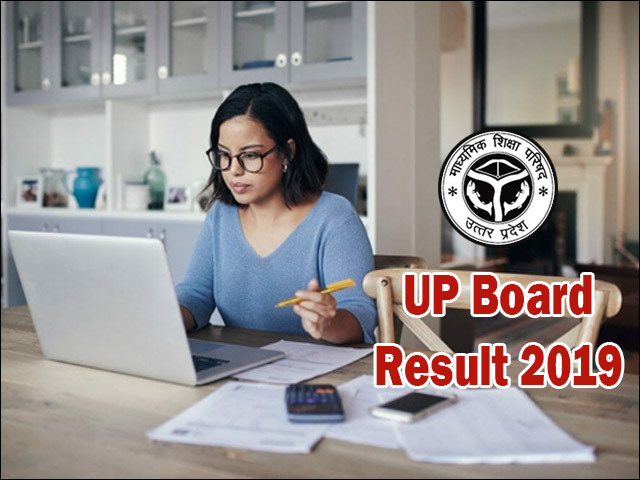 Generally, the UP Board or the UPMSP declares the UP Board 10th Result 2019 and UP Board 12th Result 2019 online on their official website. This is done to ensure timely delivery of the UP Board Results 2019 to nearly 60 lakh students in an efficient and convenient manner. However, UP Board High School Result or UP Board Inter Result downloaded from the official website or any other source is not an official document. The Board will make official marksheets available to the students through their respective schools. Students must keep in mind that colleges will only accept the original marksheet issued by the board for admission formalities. Therefore, they should collect the UP Board 10th and 12th Result marksheet before the start of college application process. Post the declaration of the UP Board 10th Result 2019 and UP Board 12th Result 2019, the UPMSP will also release an official notification regarding the re-checking and re-evaluation process to be followed by the students. The options of Rechecking & Re-evaluation are made available to those students who are feel that their answer sheets have not been evaluated fairly. Generally, the rechecking process involves re-tallying or re-totalling of all the marks awarded to the students. On the other hand, re-evaluation process is availed by the students who want to get their answer sheets rechecked. The detailed notification for UP Board Result 2019 for rechecking and re-evaluation process will be released by the board shortly after the declaration of the result. Students will have to pay a nominal fee to get their answer sheets rechecked under this process. Students can more details about it from the UPMSP website or from their respective schools. Once the UP Board Result 2019 are declared, the Uttar Pradesh Madhyamik Shiksha Parishad will conduct the Compartmental Board Exams for the students who want to reappear for the exam to improve their score or clear a few subjects in which they have failed. Generally, the UP Board Compartmental Exam is held in the month of May followed by declaration of the UP Board Compartmental Result 2019 for 10th and 12th Class Students in June. The UP Board Result 2019 Compartmental gives students a second chance at clearing the exam without wasting an entire year. The Uttar Pradesh Madhyamik Shiksha Parishad (UPMSP) is the apex school-level educational body that looks after the development, promotion and regulation of school education in the state. The Board of High School and Intermediate Education Uttar Pradesh conducts the annual UP Board High School Exam for Class 10 students and UP Board Intermediate Exam for Class 12 students. Every year, approximately 60,29,252 candidates appear for the Class X and Class XII Board Exams. The UP Board has increased the re-evaluation fee by five times. Know the details. UP Board 10th and 12th Result 2019 will be declared next week, as per sources from UPMSP. The UP Board Result 2019 for High School and Inter students will be available online upresults.nic.in. UP Board class 10th and 12th results are expected to be released by last week of April. Check details here. The UPMSP which is one of the largest state boards in India will start the class 10 and class 12, 2019 examinations in the month of February. The UP Board Class 10th and 12th Results 2018 has been announced on the official websites, i.e. upmspresults.up.nic.in and upresults.nic.in. The Uttar Pradesh Madhyamik Shiksha Parishad (UPMSP) has announced the class 10 and class 12 results. The scorecards are now available on the official website of the board i.e. upmspresults.up.nic.in and upresults.nic.in. The UP Board Class 10th and 12th Results 2018 has been declared on the official websites, i.e. upmspresults.up.nic.in and upresults.nic.in. UP Board Class 10 and Class 12 Results Declared. To know your UP Board Result 2018 visit upresults.nic.in. Find out pass percentage and UP Board Toppers here. The Uttar Pradesh Board has confirmed that the UP Board Intermediate Results 2018 and UP Board High School Results 2018 will be announced today. The Uttar Pradesh Madhyamik Shiksha Parishad (UPMSP) is likely to announce the UP Board Result 2018 by the end of April, as per the media reports. If true, nearly, 50 lakh students who have appeared for the exam this year will receive the outcome of their hard work in the form of UP Board 10th Result and UP Board Class 12 Result 2018. Students can visit results.jagranjosh.com to get all the latest updates about confirmed UP Board Result 2018 date. UP Board Result 2018 for nearly 50 lakh students will be announced by April end, as per media reports. The reports in leading dailies have suggested that the UP Board 10th Result 2018 and UP Board Class 12 Result 2018 are expected to be out by the end of this month. However, UP Board is yet to confirm the news at their end. Jagranjosh.com will provide regular news and updates about the UP Board Result 2018. Students can visit results.jagranjosh.com to get the confirmed UP Board Result date and other updates. The anxious wait of nearly 50 lakh students will end soon, as the UP Board Result for 10th and 12th Class are likely to be announced by April end. As per media reports, the Uttar Pradesh Madhyamik Shiksha Parishad might announce the UP Board Class 10 Result and UP 12th Result 2018 by end of April. Until last year, the UP Board Exam Results were announced around mid-May. Students can visit results.jagranjosh.com to get all the latest information and updates about UP Board Result date. The UP Board 2018 Class 12th Physics-I question paper has reportedly been leaked before the beginning of examination in Chandauli district, today. Uttar Pradesh High School or class 10th and Intermediate or class 12th Board examination, 2018 which was scheduled for February 6, has already begun, on time. The UP Board has finally announced the UP Board Intermediate results today. The results are now live on board’s official website www.upresults.nic.in. Students can also visit up12.jagranjosh.com for fast and easy access to their UP Intermediate results. The UP Board Results 2017 was declared on www.upresults.nic.in. Nearly 60 lakh students will be able to check their UP Board 10th Result 2017 and UP Board 12th Result 2017 online. UP Board Result will also be available online on up10.jagranjosh.com / up12.jagranjosh.com. As per the recent news break, the UP Board Results 2017 will be announced on 9th June. Although UP Board is yet to issue an official notification, media reports suggest that UP Board 10th Result 2017 and UP Board 12th Result 2017 will be announced on 9th June on upresults.nic.in. The Board of High School and Intermediate Education Uttar Pradesh (UPMSP) is likely to declare UP Board Results 2017. Recent update suggests that the UP Board 10th Result and UP Board 12th Result 2017 will be announced in first week of June on official website upresults.nic.in. UP Board Results 2017 official notification to be out soon on upmps.edu.in and upresults.nic.in. As per the officials of UP Madhyamik Shiksha Parishad (UPMSP), the UP Board High School Result 2017 and UP Board Intermediate Results 2017 will be announced by last week of May. UP Board Exam along with board exams for other poll-bound states i.e., Punjab, Uttarakhand, Goa and Manipur; may be delayed due to assembly polls. Get latest updates here. The Election Commission has accepted UP Board’s proposal to begin the UP Board Exam 2017 to 16th March. Get the full details about this here. The UP Board Exam 2017 Datesheet has been sent to EC. UP Board High School Exam and Intermediate Exam likely to start on 16th March. UP Board Exam for Class 10 and Class 12 students to begin from 6th February 2017. Get the exact date and full UP Board Date Sheet 2017 details here. The UP Board is expected to announce the UP Board Result 2016 Today 15th May 2016 (Sunday) at 12:30 PM. Visit upresults.nic.in, results.nic.in, upmsp.nic.in or up10.jagranjosh.com and up12.jagranjosh.com to check your results. The Uttar Pradesh Board Results 2016 are going to be announced on May 15. After the formal declaration, UP Board 10th Result and UP Board 12th Result will be available on different result portals like http://up10.jagranjosh.com / http://up12.jagranjosh.com. Alternatively, students can also visit official websites upresults.nic.in and upmsp.nic.in to check their results.